I complained last year that we have only had one Grand Final in the last 12 years with two likable teams involved* and while all five of the “hateable” teams made the finals, last weekend’s results saw four of them lose and two of them eliminated as a result (a massive win for Rugby League) so it seems we may actually be in with a chance of having a good Grand Final again. Having popular teams in the finals is an issue for the league, and not for the obvious reasons of ratings etc. In my opinion it is one of the main contributors to the perception that has crept in over the last decade that Origin is the pinnacle of the game. By the time the Grand Final rolls around, nobody cares who wins. Not because their team is out, but because the teams that ARE there are so often detestable. Growing up however, the Grand Final was everything. Winning the competition was the pinnacle of the game and that was unquestioned. My team had won the competition more than any other and it had been a while between drinks but we were surely due again any time soon. So with this thought in mind, I want to celebrate the greatest Grand Final that the competition has ever seen; the 1989 decider between Balmain and Canberra. This year marks the 25th anniversary of the game that is the undisputed best Grand Final ever**, and it is worth celebrating the wonderful match that it was. But before we do that, there is another story to be told in the lead up that is close to my heart. It had been 18 years since South Sydney, the league’s most successful team, had won their last Grand Final and by the mid-point of the 89 season, they were riding on what would end up being a 12 match winning streak and were leading the competition. This was going to be their year. By the end of the regular season they were 5 points clear on top of the table and near certainties to break the drought. After a first up loss in round one of the season, they had lost only 2 matches in their next 21 with both of those losses coming against quality opposition in fellow finalists, Penrith and Cronulla. They had the best defence in the league, as the only team averaging less than 10 points conceded per match, and as the old saying goes, attack wins matches, defence wins premierships. The finals format back then was such that only the top 5 teams made it and there was a major reward for the Minor Premiership winners. In the first week of the finals 4th played 5th with the loser being eliminated and 2nd played 3rd with the loser playing the winner of the other match and the winner playing the Minor Premiers. In the Minor Premiers’ first match, they can win and go straight through to the grand final or lose and still get a second shot. So for the Minor Premiers to win the competition, they only had to win 2 matches. Not only that, but If you finished in either 4th or 5th, you needed to win 4 consecutive sudden death matches to win the Grand Final. The difference between 1st and 4th was enormous. Especially compared to now, where they play each other and the loser gets a second chance while the winner (even if it is the 4th placed team) assumes all of the benefits that the Minor Premiers would have gotten. Just like the upstart Panthers have done this season. But I digress. The Rabbitohs got to sit back and watch week one of the finals as the streaking Raiders*** demolished a tired Sharks outfit who had to win a mid-week playoff with Brisbane (after finishing in equal fifth) just to get to the finals. In the other match, Souths got the result they wanted. The only team that they hadn’t beaten at all that year – The Panthers – had been beaten by the third placed Tigers. They were the biggest threat to ending the drought and the Tigers had done Souths a favour and taken them out of the equation. So of course this set up a clash between Balmain and South Sydney for a direct line to the Grand Final. In their only meeting of the season, the Rabbitohs had prevailed 10-8 in a tight contest and that game was played at Leichhardt, where the Tigers only lost twice all season. This is significant, because Balmain’s home form is what carried them to their 3rd place finish. Their away form left a lot to be desired. They only won 5 of their 11 matches outside of Leichhardt Oval and the fact that this game would be played at the SFS was a significant factor to tip the scales even further in South Sydney’s favour^. The one thing that the Tigers did have on their side was finals experience. They had made the Grand Final the season before only to be belted out of it when Terry Lamb took on Ellery Hanley early in the match. So it was with this battle hardened mentality that they used experience to outpoint the Minor Premiers in a 20-10 victory that gave them a chance to make up for the previous season. In the other match, the Panthers had been bounced out of the finals in straight sets as the young and talented Green Machine began to gather momentum for another tilt at the title with a 27-18 win. The Raiders had made the Grand Final in 1987 but lost to Manly, who were the dominant side that season and on the day. Since then, the emergence of two future superstars had begun with halfback Ricky Stuart and (at the time) centre Laurie Daley – both in their first full season in the top grade – beginning to take centre stage along with the already established stars like Mal Meninga, Gary Belcher and Brad Clyde in Canberra. So the Final match to see who would join the Tigers in the big one at the end of the season was set up between the surging Raiders and the beaten Bunnies. With four rounds to go, the Raiders weren’t even in the top 5, and from their final position of fourth they had a chance to go to the Grand Final with one more win over the competition’s best team. But this wasn’t going to be easy. The Raiders had been comfortably beaten on the two occasions that they had faced the Rabbitohs during the season, and in spite of having the best attack in the competition (averaging 21 points per game) they had only managed 14 total points in the two full games, including being held try-less by the Bunnies for the only occasion in their whole season. When my Dad told me that he had gotten us tickets to the game, I was immensely excited. It was the biggest game the club had played in since I was born (granted, I was only 8) and I couldn’t wait for that Sunday afternoon to come. We had great seats. On about the 20 metre line, and to my father’s delight, we were directly behind the Raiders Cheergirls. To his further delight, the ladies got quite a workout that day.^^ The Canberra attack found its way through the Bunnies’ famously strong defence to the point that it completely ruined South Sydney to its core^^^. The final score line of 32-16 doesn’t tell the full story. Canberra were dominant from start to finish. The three tries that the Rabbitohs scored were all by forwards as the backline was completely shut down. The game was over with 20 minutes to go. With 10 minutes to go Dad asked if we could leave early to beat the traffic. I was a depressed 8 year old and agreed. As we left the stadium another cheer went up. I knew it was the Raiders who had scored and my shoulders slumped a little more. “What is wrong with you?” he asked me. Bewildered I looked back up at him and all I could say was “Souths lost!” His reply of “Was there a game on?” went over my head at first. Then I remembered the cheerleaders that he had spent the whole day enjoying. So the Grand Finalists were decided. The 3rd placed Tigers and the 4th placed Raiders. Never before in the history of the league had neither the first or second placed team made the Grand Final. On top of this, Canberra had never won the competition before and Balmain hadn’t won in 20 years. Due to this there was genuine excitement about the Grand Final – regardless of who was going to win. There used to be a saying about Rugby League Grand Finals that ‘you have to lose one to win one’ meaning that you simply can’t win a Grand Final on your first go. You need to have the experience of Grand Final day, and Grand Final week for that matter, under your belt before you can win a title. Losing that first grand final not only prepares you and the club for what is needed to win, but the crushing feeling at the end of the match which regularly sees grown men crying gives you extra motivation. The Tigers had been there the previous year and the Raiders the year before that. They were both ready, and both (kind of) unexpected to be there just a few weeks earlier. Canberra were on a roll with an outrageously exciting backline, while the Tigers had an absolutely world class forward pack. It wasn’t so much a clash of styles, as a test of which was more important. The media and bookies thought that the Tigers forward pack would be enough to stop the young Raiders backline. As the game unfolded, the Raiders took the upper hand and looked the most likely, though their inexperience began to show as they struggled to turn that into points. This was all the invitation that the Tigers needed. Against the run of play, the Tigers scored an intercept try through their rugby convert winger Brent Todd. They then pushed further ahead with a wonderful try to deserving Test Second Rower Paul Sironen. At half time Balmain led 12-2 and the bookies looked to have been right to not trust the inexperience of the flashy Canberra side against hard headed power in Balmain and the coaching of old head Warren Ryan. This part was important too. Tim Sheens was coming off a 4 year stint as the head coach of the Panthers, that saw them make the finals just once – admittedly for the first time in their history, but one finals in 4 season is not a successful stint by many measures. His first season in Canberra saw him inherit a team that had made the Grand Final the previous season, take them to a 3rd place finish and to be bundled out of the finals with two consecutive losses. Even with a few weeks to go in the season, the Raiders had not been guaranteed a finals place and it was only this outstanding run of form that saw them reach the Grand Final. A lot of people were not convinced of Sheens’ credentials as a top level coach. Many still aren’t. On the other hand Warren Ryan was coaching in his 5th grand final of the previous 6 years and his 6th Grand Final of his career. Balmain was the third club he had coached at and the third club he had taken to a Grand Final. He was considered a bit of a modern coaching marvel at the time. Even if you were impressed by Sheens as a coach, there was simply no way that you could rate him higher than Ryan. Canberra had played well, they just didn’t seem able to translate that into points. Some calm half time words from Sheens appeared to have worked. They came out for the second half as a more composed side and got themselves on the board through the evergreen Chicka Ferguson finding Gary Belcher in some space to score their first try and narrow the gap. But the Tigers were not going to go quietly into the night and they stepped up their efforts. Speedster Mick Neil went agonizingly close to scoring, being stopped short by a lunging ankle tap from Mal Meninga, and when Wayne Pearce dropped the ball cold with an open try line in front of him, the man they called The Wok decided that the footballing gods had made up their minds and were simply not going to let them score again. So he had to defend the slim lead that his Tigers had built. In what has now become the most controversial coaching decision in a Grand Final since the white boots in 1975, Warren Ryan decided to pull his test forwards, Steve Roach and Paul Sironen, from the field. He sent on fresh legs to simply tackle their way to the win. Elias was charged with getting the field goal needed to put the match beyond doubt, and after he had his first attempt charged down, he took his second shot. It never looked solid, but seemed as though it might just have the legs to get there. Unfortunately for the Tigers, it hit the cross bar and came back out. Regardless, the defensive tactic almost worked. With just 90 seconds to go, the Tigers were still in the lead. Then the ball was given to the transcendent Ferguson. In the biggest play of his career, Chicka got the ball on the left side from Daley with Tigers defenders pouring across the field to cover. With a succession of left foot steps in side, Ferguson not only scored, but scored close to the posts, to enable a simple conversion for Meninga to level the scores and send the game to extra time. This is where the decision to replace Roach and Sironen really backfired. Under the interchange rules back then, they were not allowed to come back onto the field for extra time, now that the team needed the attacking impetus that those two were so famous for. The momentum that Canberra finished regulation time with was always going to transfer into extra time, and when Garry Jack knocked on two minutes into extra time, the game was as good as over. From the ensuing scrum, Canberra Five Eighth Chris O’Sullivan kicked the field goal to put the Raiders ahead for the first time in the match. The sides battled back and forth and with just a few minutes remaining, Raiders replacement Steve Jackson showed a feat of strength fitting of Lou Ferrigno. He got the ball 15 metres out from the try line, beat two defenders and then carried three further defenders for almost ten metres as he willed himself over the line to put the match beyond doubt and deliver the first ever title to the nation’s capital. No write up could really explain the greatness of the match and the buzz that came all the way through to the televisions that day. If there is any justice in the world, Foxtel will be showing replays of this game in the week leading up to the Grand Final and I urge you all to watch it if you get the chance. 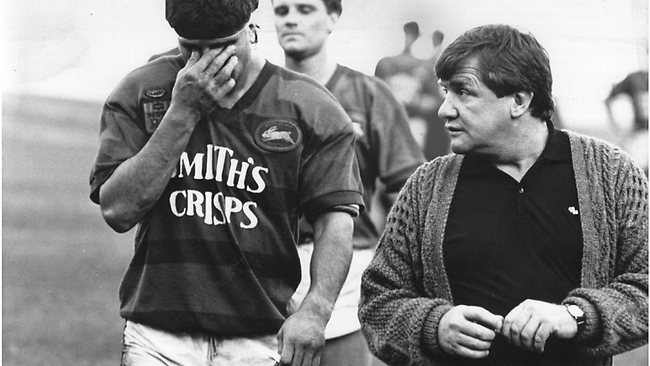 The Raiders went on to win the Grand Final again in 1990, lose it in 1991 and then win it again in 1994, all under the eye of Tim Sheens, with that same core of players. Sheens parlayed that into an unsuccessful stint as the Head Coach of the North Queensland Cowboys, and then another title in 2005 with his nemesis from that fateful day, the Tigers, and is now the coach of the Australian national team. Warren Ryan on the other hand did not go on to much further success. The following season the Tigers scraped into the finals in a playoff and went no further and Ryan moved on to Wests where he again scraped into the finals for a couple of seasons, then guided them to a couple of 13th place finishes. He then left coaching for a few short seasons before coming back and leading the Knights to a couple of semi-final series losses#. He never coached in a Grand Final again and eventually moved into a commentary role for radio which he was recently fired from in a storm of controversy over allegedly racist remarks. His career essentially took a slow downhill slide after this match, and I can’t help but wonder what might have been had he not made those changes late in the game. So as we mark 25 years since the greatest grand final, let’s all hold our breath and hope for another one this year. At the very least, let’s hope we don’t all hate both of the teams that make it. *The one is obviously the 2005 Grand Final. The only Grand Final I have actually attended in my life. ** You want proof? It is the only pre Super League Grand Final to have its own Wikipedia link as I write this. If that’s not proof, then there probably isn’t any. So there isn’t any. ***They won their last 5 games of the season to finish in 4th spot. Their last loss? Souths. ^Funnily though, Souths’ form at home wasn’t THAT great, with all of their (admittedly few) losses for the season coming at the SFS. ^^^Seriously. This is no exaggeration. Souths finished last the following season, and didn’t even make the finals again until 2007 – a full 18 years later – while picking up 4 wooden spoons along the way! #This may have been a little more impressive had the Knights not won the competition the very season after he left and 2 seasons prior to his arrival. As it stands, he may have been holding them back.